1st three photos: These doors are hinged, not sliding shoji screens, some of a series, in different rooms within a house. 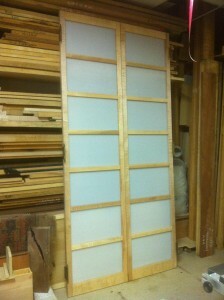 Curly soft Maple, Lucite (thence Modern), with antique Eastlake hinges supplied by the client. 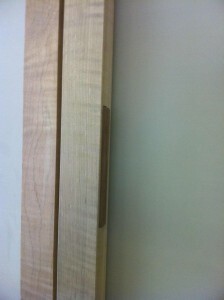 Livos oil finish, imbedded magnets as closers. Installed as closet doors, 10 feet high, they can be dis-assembled to replace Lucite as required – they are backlit by lighting within the closet. 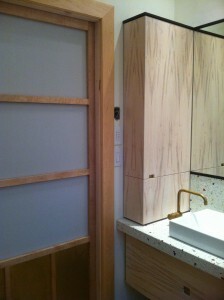 4th photo: a sliding shoji in the washroom, also Curly Maple and Lucite, with vertical brass panels in place of the hipboard, as a cat-scratch-proof device. 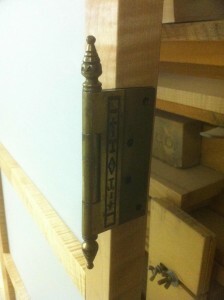 The cabinet pulls are matching inset brasses. 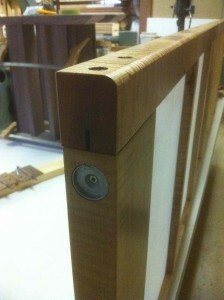 5th photo, the integral Walnut pulls.